ahhhh, the month of LOVE…. It’s all over the internet and it’s about to be all over my little section of the internet as well. You know, I love me some printables! But there are so many cool, fun things to make, too. So, this week I ended up with 2 link loves…. 1. I saw this post-it note cover from Style Crush and just think it’s adorable. What a cute gift idea! 2. 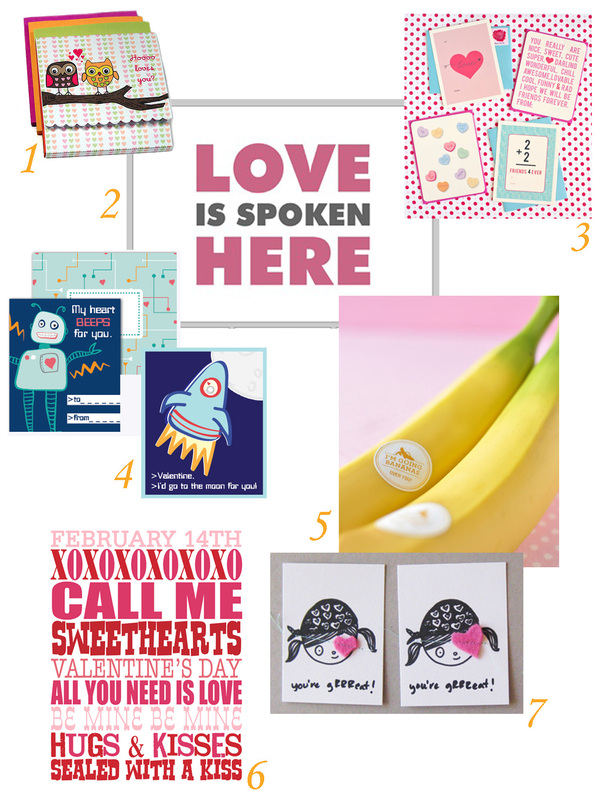 Check out Sprik Space’s Love is Printable and all her other cute printables. I had to pick one, but I could decorate a whole wall with her pieces. 3. ahhhhh….. The cards from One Charming Party are just charming (ok, kinda silly, but it’s so true). 4. I’m always drawn to the space theme (I have one coming up to share in the next couple of days) so these two cards from Cottage Industrialist jumped right out at me. 5. I saw these and know they are very cute Valentine messages, but these fruit stickers from Twig and Thistle would be awesome to find on my fruit every day of the year. 6. This ‘subway art’ seems to be very popular these days. And I love it…. Check out this one from eighteen25. I’ve already printed mine! 7. And the pirate… Have you ever set your facebook language to pirate? It’s hilarious. So when I saw these I just laughed because I could totally hear the little boys and girls giving and receiving these cards by Mer Mag with their pirate accents! 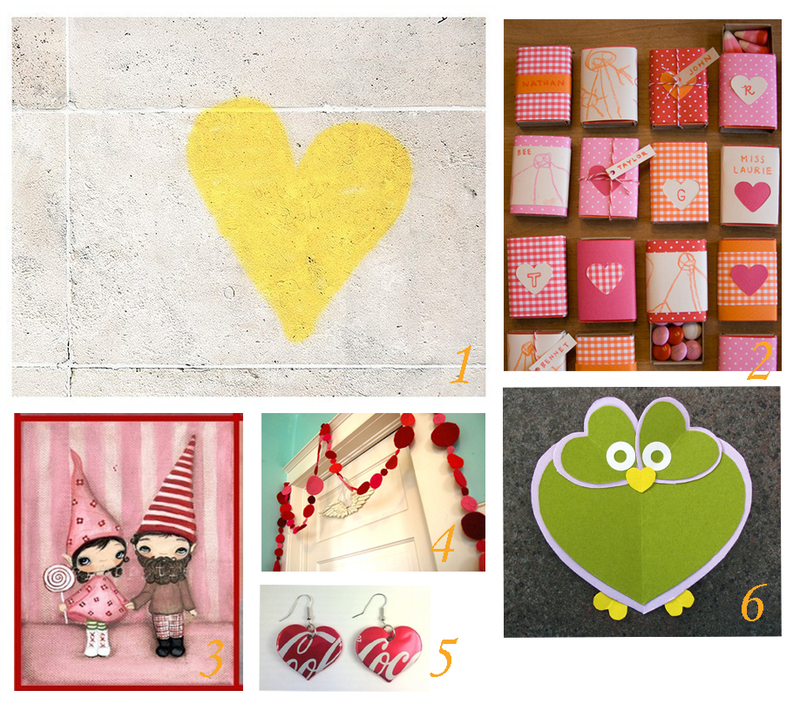 And the ‘Let’s Make’ a Valentine Link Love…. 1. Love the simplicity of this one. Photography by Little Brown Pen. 3. Sweethearts art by The Poppy Tree. 4. I love the garland by Big Brown House. I’ve also wanted to make a felt garland for Christmas, but this one is perfect for the upcoming Valentine’s celebration. 5. Ok, so I have a little addiction… I have to admit… I’m addicted to Coca Cola…. I heart Coca Cola. I just had to add these earrings by Funky Recycling because I do love my Coca Cola. 6. And last, but not nearly the least… The cards my son and I are going to make for the grandparents this weekend are by Live, Learn, Love. Great ideas all over! Thanks for linking to me! Thank for including my sticky note cozy! Such cute stuff featured here – I love your tutorials too!